Features unique, patented technology that ensures flexible, resilient nail enhancements that suit your clients’ needs. Award-winning Sculpting Liquids that provide the foundation for wearable, durable, beautiful nails. Advanced Sculpting Powders come in a wide spectrum of shades that provide easy workability and gorgeous results. Essential products for ensuring successful liquid and powder enhancements adhesion and removal. Provide essential products and tools needed to create exceptional liquid and powder enhancements. Liquid & Powder Systems give you the power to create durable, beautiful nail enhancements that clients will love. First, determine which Sculpting Liquid is best for their needs. RETENTION+® Sculpting Liquid provides advanced adhesion with the natural nail to prevent lifting. RADICAL SOLARNAIL® Sculpting Liquid is tough, resistant, and resilient. Perfect for clients with enhancements that are prone to cracking and chipping. RETENTION+® Sculpting Powder provides superior clarity and color stability, while Perfect Color Sculpting Powder provides superior moldability and extensive color and coverage options. 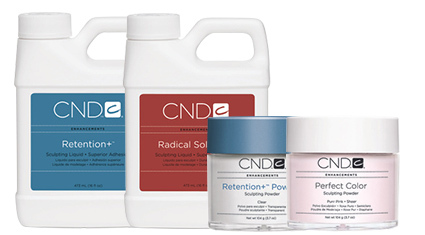 Be sure to use CND® liquids and powders together as a system for the best results.